Both the Ecosystem Support Team and the Wetland Ecosystem Support Teams will be working on reticulated flatwood salamander recovery efforts. Gulf Power in partnership with the National Fish and Wildlife Foundation and other groups announced its 2018 round of Longleaf Stewardship Fund grants that will benefit habitat restoration and species recovery across Northwest Florida. The lion’s share of the $1 million — $920,000 — has been awarded to Longleaf Alliance for work on Gulf Coast Ecosystem Plain Partnership lands. GCPEP is a collaboration of 15 public and private landowners with over 1.3 million acres of land that stretches from the Florida-Alabama border on the west, east to the Choctawhatchee River and includes the Conecuh Forest that adjoins the Blackwater River State Forest on the northern border of Santa Rosa and Okaloosa counties. The partners take a landscape approach to conserve and restore the dwindling longleaf pine ecosystem. Restore and maintain 112,958 acres of longleaf pine habitat within the western panhandle of Florida and southern Alabama. Prioritize and accelerate, in this same area, recovery of declining and at-risk species, including bobwhite quail, gopher tortoise and reticulated flatwood salamander. Support local environmental conservation jobs. There are only 29 known reticulated flatwood salamander breeding wetlands that have been recently occupied in the Southeast U.S. and 27 of them are on the GCPEP land in the Gulf Power service area. This new grant will allow the Ecosystem Support Team to do more work with partners to help save these rare salamanders. The GCPEP funding will also provide more money for a project launched last year to rescue gopher tortoises from construction sites in Central and South Florida and relocate them to the Eglin Air Force Base conservation lands. The project’s goal is aimed at bolstering the populations to prevent the tortoises from being listed in 2023 under the federal Endangered Species Act, a development that could impact some of Eglin’s training and testing operations. Thanks to these new grant dollars, a University of West Florida research team including students will be participating in a new project — the National Bobwhite Quail Initiative Focal Area will be developed to support bobwhite quail habitat restoration and recovery in the Conecuh Forest. Compton explained that the students will go into the forest and learn how to recognize the bird’s calls to conduct rare bird and quail research and monitoring, to determine if GCPEP habitat and species restoration efforts are successful. The fire-adapted longleaf pine ecosystem once encompassed more than 90 million acres across the Southeast, but it has been reduced to only about 5 percent of its historical range. It supports immense biodiversity and important game species such as the bobwhite quail, wild turkey and white-tailed deer. Other Longleaf Stewardship Fund dollars such as the one awarded to Tallahassee-based Tall Timbers will be at work in the Gulf Power service area with conservation assistance programs involving prescribed burns and an outreach program to enhance future longleaf restoration. A complete list of the 2018 grants made through the Longleaf Stewardship Fund is available here. b-roll: https://youtu.be/XoZ0x4AeVAo Kaiden Spurlock, Longleaf Alliance Ecosystem Support Team manager, checks red-cockaded woodpecker nests his team maintains and monitors in a Longleaf Pine Forest in Blackwater River State Forest. 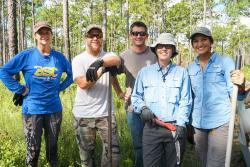 And conservation workers with Longleaf Alliance help with a reticulated flatwood salamander pond project in a Northwest Florida forest to improve breeding success. Group shot: Gulf Coast Ecosystem Plain Partnership developed a team of specialists called the Ecosystem Support Team to work across the entire landscape. Both the Ecosystem Support Team and the Wetland Ecosystem Support Team, pictured here, will be working on reticulated flatwood salamander recovery efforts. All of the team members, under the Longleaf Stewardship Fund, will be able to help the 15 GCPEP partners with important conservation projects. Fencing: The Wetland and Ecosystem Support Teams are installing fencing around a known breeding site for reticulated flatwood salamanders in preparation for breeding season. The area was burned, a process that would have happened naturally to control brush overgrowth before fires were suppressed in longleaf pine forests. Pine tree: The Ecosystem Support Team helps install and monitor red-cockaded woodpecker nesting cavity in longleaf pines, to help support the recovery of the species. The woodpecker does its part to protect its home by drilling small holes around its nests to excretes sticky sap to prevent predators from raiding the nest. Gulf Power serves more than 460,000 customers in eight counties throughout Northwest Florida. The company’s mission is to safely provide exceptional customer value by delivering reliable, affordable and environmentally responsible electricity while strengthening our communities. Visit online at MyGulfPower.com or on the company’s Facebook, Instagram and Twitter pages. News information can be found at GulfPowerNews.com.